Stever Hill Vineyards is located in Branchport, New York, near the northern shore of the west branch of Keuka Lake. Just 90 minutes from Rochester and Syracuse, an hour from Corning, 45 minutes from Canandaigua and Geneva, and minutes from Keuka Lake State Park and Penn Yan. Stever Hill Road is easily accessible via Route 54A/West Lake Road in Branchport. 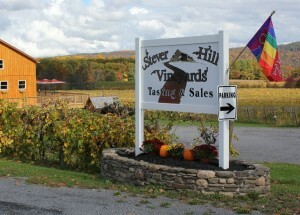 Look for Stever Hill Vineyards roadside signage in Branchport.